Thanks for the added information. I really wasn't that worried. I've seen and heard of their protection. Guess I took a misstep on trying to make a funny. I apologize. Congratulations on the RATN! 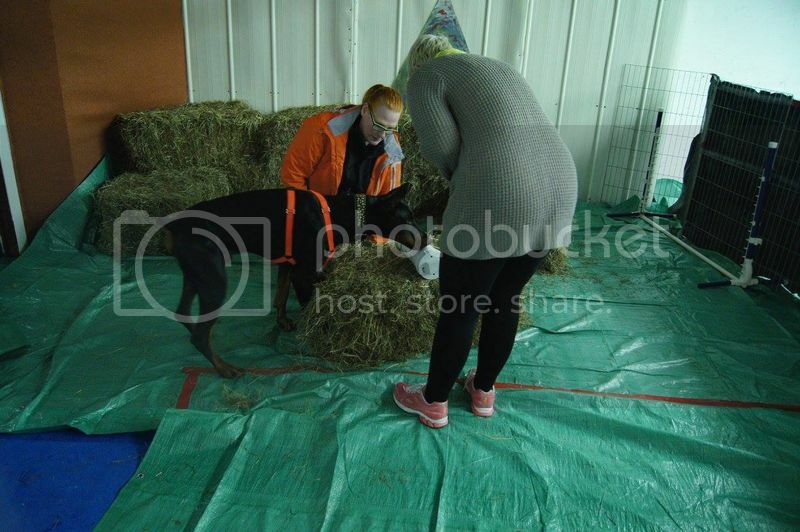 Your comment made me laugh - my sister-in-law is training her Malinois for SAR. She told me that one of the members of their SAR group has a cap with "Trust the dog" embroidered on it. It's hard to not make assumptions about things but the dogs are unencumbered by our predisposition to worry that we found things too quickly. Since I volunteered as a rat wrangler I learned a lot! 1. Too many people are talking (find it, look here, tunnel...)and not paying attn. to their dog. Many times once the dog finds it and the handler isn't paying attn. they won't go back to that spot because they believe they already showed the handler where the rat was. 2. My dog DOES have a signal, 2 in fact, sometimes she points and sometimes she pounces, BUT on our first trial run she did neither and just kept going back to the same spot so I called it. IF YOUR DOG KEEPS GOING BACK STOP REDIRECTING THEM!!! So many times this one happened because the handler thought they knew where the rat was and called it wrong. Dax went to her first Barn Hunt today. First we learned about the sport and then we were introduced to the rats and hay bales. We were divided into two groups. 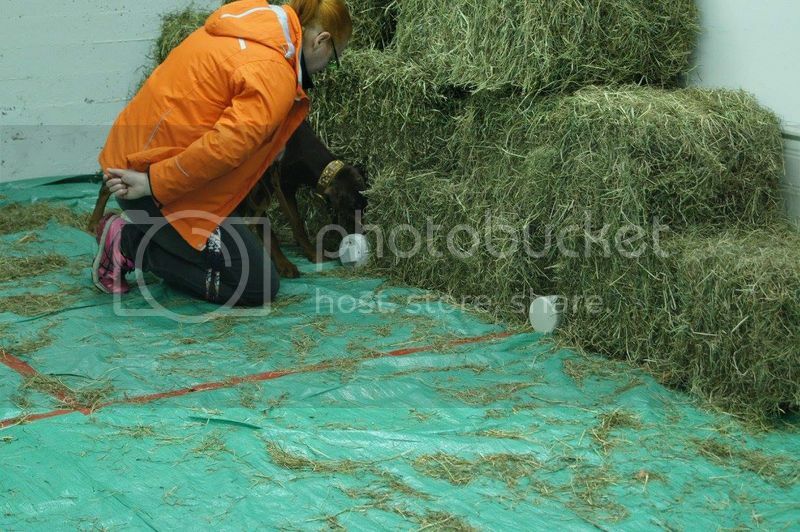 First it was rat introduction and then we switch and went to hay bales. Dax was hesitate to enter the tunnels at first then after several attempts she went in. Never did get the climb. After lunch we did 2 fun runs. Dax's first time was one minute and the second time was one minute 30 seconds. After today I know that my heart is 100% NoseWork and will continue with that sport. It was a good time bonding however Barn Hunt is not for us. 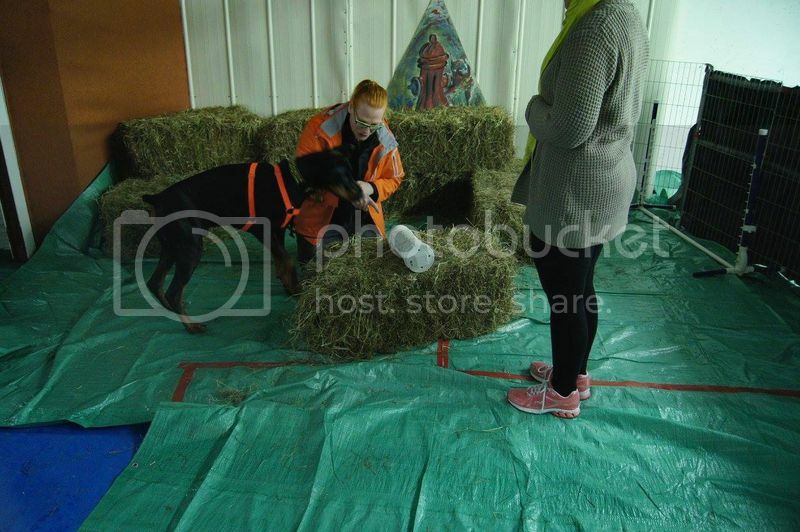 Alberta's Inaugural Barn Hunt Trial - Introduction to dBella Dobermans. 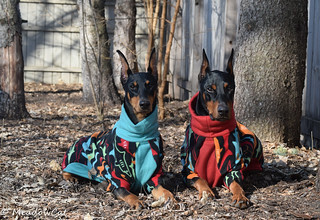 Anywho, I like dbella Dobes and noticed on their blog that gerbals are used instead of rats, as Alberta tries to be a rat free zone. There I think it worked this time. Last edited by Darkevs; 03-06-2016 at 11:50 AM. Yes, gerbils are allowed, but only in locales where pet rats are illegal. I'm so excited. One week from today both Sienna and Tank will be taking part in the first ratting workshop in our province. It's an hour and a half drive away but idc. We're so excited! Did I mention I'm excited? are you excited or what. No, you didn't mention that you were excited. Barn hunt went well today. Tank was on point and very interested in what wa going on. Sienna was interested but distractable. She did show interest and ability so we're looking forward to doing more work with her. The new rulebook will be available on the BHA website April 1st, and will be implemented May 2nd, according to the BHA Facebook page. Ivan will be doing barn hunt for the first time at Nationals. I didn't see much of a description, so I have no idea what to expect. Considering his hatred of squirrels, I don't think it will take him long to pick it up. Should be interesting! I love watching dogs play at barn hunt. My previous Doberman Hannah loved it from day one, she wanted to kill the tubes holding the rats upon first sight. My Dane Finnegan has a slight dislike of the rats, but will humor me and just thinks of them as another odor for nosework. 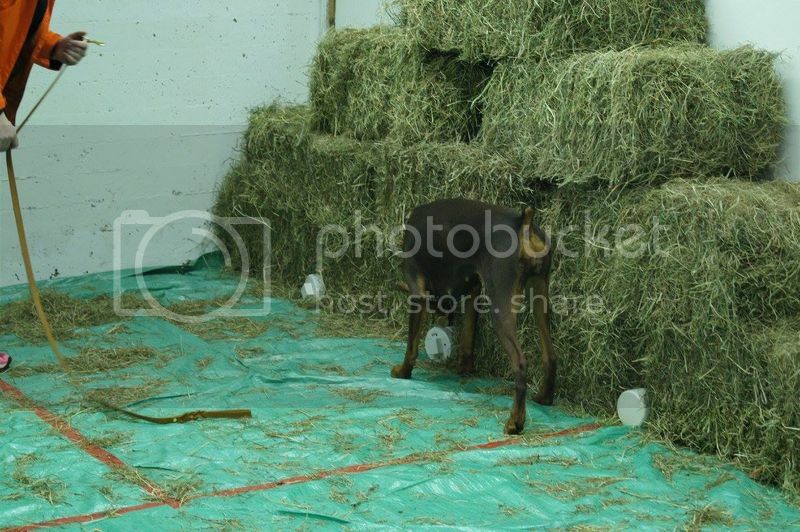 He enjoys playing on the hay bales, is all about climbing and lately, about tunneling. 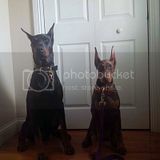 My current Doberman Addie just started classes. I thought she would be all about getting at the rats, but she is more like my Dane. She can be convinced that rat smell pays, but she isn't intrinsically motivated to find them. I think Addie would be super excited to chase a rat, but since they don't move much in the tubes, she doesn't find them that interesting yet. Mac is a barn hunt monster. He is signed up for a trial mid March- hoping get his Novice title then! He has so much fun! I know my girl would love to barn hunt. She chases and goes after everything that moves. She has gotten two moles in my yard with the second one being a few days ago. I know she would be good at finding them, but not sure how trainable she would be to "stop" once she found one. She tends to go overboard with her excitement. looks fun! I've always wanted to try it with my dog, any tips for a beginner? I've got a friend who's dog with super high prey drive (successful killer of woodchucks and other smallish wild animals) absolutely hates barnhunt, because she can't get to the rats and kill them. Check on the BHA website to see if there is a club near you. A lot of them offer clinics and/or classes. Otherwise, just teaching your dog to go through a tunnel and climb on stuff is helpful. Some people teach barnhunt like the do regular nosework, of course, using the rats instead of oils. Not sure if this will work, but attaching the link to Mac's barn hunt video. He definitely is into 'barn' hunting. Jazzy does kill them, but I don't think she means to. She likes to play with them. You could be right though. Thanks! looks like there are classes sort of near me, maybe ill check it out this weekend! Finn and Adele were also at a barn hunt trial this weekend. Finn already had his RATI, and had two novice runs with no Q. However, he was the most relaxed I've seen him at a barn hunt trial, especially in the blind, which was a huge win for us! Finn practices barn hunt probably at the open or senior level, but has a hard time trialing where no food is present. This was Addie's first trial and she got her RATI and two legs towards her RATN! She is a super sniffer, I have been very happy with her progress in barn hunt and nosework.